A mountain of smoky and very tender pulled pork on good ciabatta bread, dressed with a marinated coleslaw and pepper jack cheese. Ciabatta is an idle bread for this sandwich. The pork is juicy and the dressing from the slaw make this sandwich a bit messy, the nooks and crannies in the bread help hold that together. (hint, don't try and eat this while driving like I did, the steering wheel gets slippery). The pork is sweet, smoky, and buttery soft. The coleslaw is tangy with vinegar and balances the sweetness of the meat. I'm not sure what the pepper jack is doing there. I really couldn't tell it was there until I looked. It doesn't offend, but it doesn't add anything for me. Ciabatta is a good chewy bread and this sandwich needs it to slow you down, else I at least would have wolf it down too fast to actually savor. Synopsis: A great and distinctive pulled pork sandwich. Four big macaroni and cheese balls, stuffed with plenty of crawfish, dusted with Parmesan (they look like Beignets here!). Served with jalapeno ranch dressing. The balls have plenty of crawfish in them, and a really good crust on them. The jalepeno ranch has just enough zip from the pepper heat to be noticeable, but not too much to over power the crawfish. Mine were gone too fast. For a Cajun inspired dish though I would have expected a bit more spice in the cheese sauce, this sauce is quit mild. 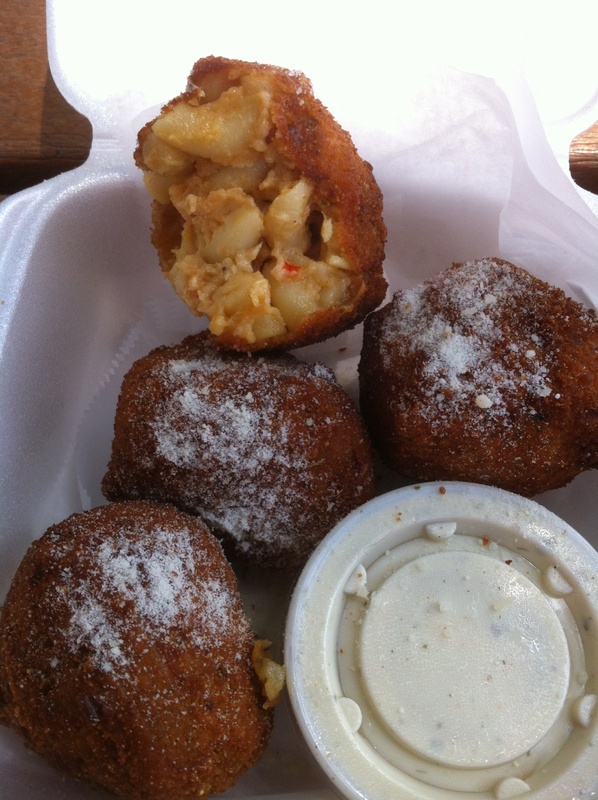 Synopsis: One of the best versions of mac a cheese balls in Houston.